A while later, Katie & Jacob put together a wedding where they reaffirmed their vows and celebrated with their family and friends. Katie started the day at her sister’s house with her family and bridesmaids. 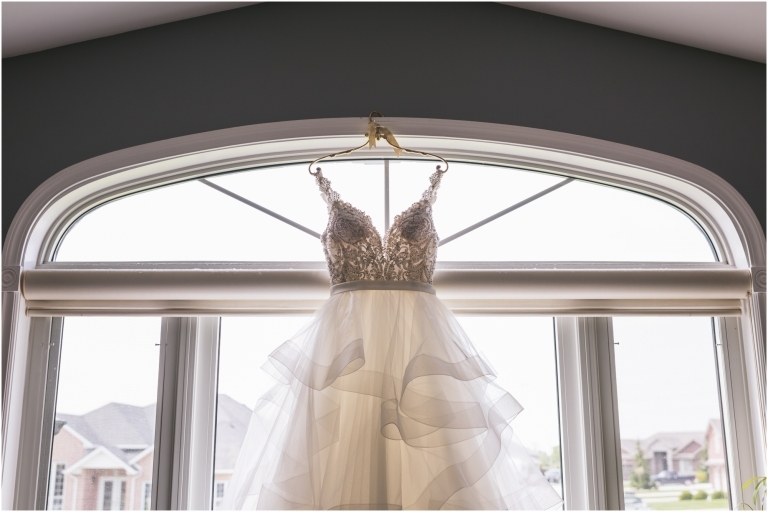 Katie’s Allure Bridal dress hung from the window, while she and her bridesmaids relaxed with a bottle of bubbly in matching robes and ‘bridesmaid’ champagne glasses. 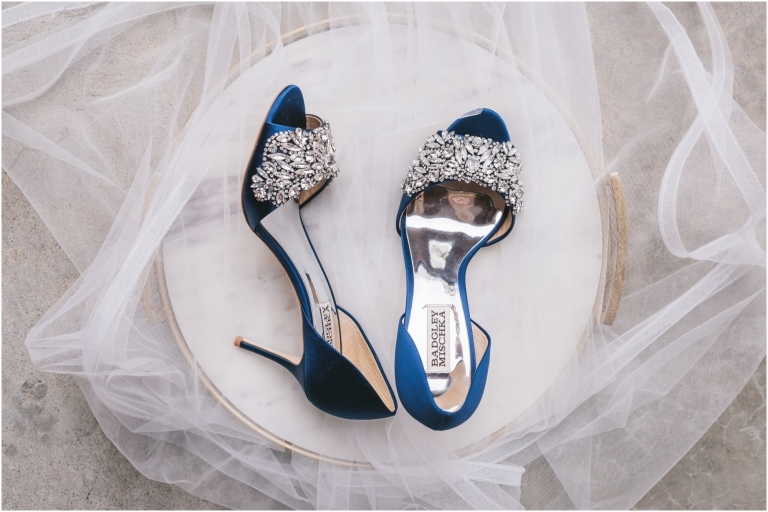 As they were pampered, getting their hair done and makeup applied, Arica spent some time photographing the details of her day – her Badgley Mischka shoes, her gorgeous bouquet from Thiessen’s Flower Shop and her beautiful earrings. Once they were ready to go, Katie sat down to open her gift from Jacob – a basket full of thoughtful gifts, an emergency kit, and shoes he had HAND EMBROIDERED himself with ‘Mrs. Merritt’ and their wedding date. Best. Gift. Ever. She stepped into her dress and flats with the help of her mom and bridesmaids and was beaming from ear to ear as we snapped a few bridal portraits. Jacob’s day started at his parents’ house where the guys were pampered themselves. Jacob brought in a hairdresser to make sure everyone was in tip-top shape for the day, and they took turns between bites of the delicious pulled pork sandwiches. Jacob got into his Calvin Klein charcoal suit, but not before presenting the guys with the most thoughtful groomsmen gifts I’ve seen yet – customized beers with caricatures of each of his groomsmen. Everyone was blown away at the attention to detail! Once they were both ready for the day, they met at Lakeside Park in Kingsville for their first look and wedding party portraits. Jacob took his place at the bottom of the hill, and Katie snuck up slowly behind him for their first look. She tapped him on the shoulder and of course, was met with a tight hug and admiration from Jacob as soon as he turned around. They barely stopped smiling throughout their portraits as they soaked in every minute together underneath the giant trees the park has to offer. Their wedding party soon joined them for photos before heading to Mastronardi Estate Winery for their ceremony and reception. The winery looked spectacular, as always! The tables were draped in cream and gold lace linens, white drapery hung from the ceiling behind the head table, blush napkins sat atop gold charger plates at each setting, and dark wooden chairs and gold candles added warmth to the room. Guests mingled, signing the guest book before heading outside to take their seats in front of the vineyards where the ceremony was to take place. Jacob opened his gift from Katie as he waited – an artist’s sketch of a portrait of their city hall ceremony (they are both such thoughtful gift givers!) – before he and his groomsmen took their place in front of the wooden arbor. As the ceremony started, the bridesmaids made their way down the aisle, and then it was Katie’s turn. The guests stood and Katie emerged with her dad and walked confidently towards Jacob to once again affirm her commitment to him and their life together. They had so hoped for an outdoor ceremony and the timing of everything perfectly fell into place (as it always seems to do with them) as the raindrops started to fall as soon as the guests had finished entering the venue. We made use of their head table’s backdrop for their family portraits and soon the cocktail hour was over and the party was about to start. The dinner, speeches, and dances were all incredible. We were even able to sneak outside just after the rain for the most epic sunset. Overall, it was actually a perfect day. 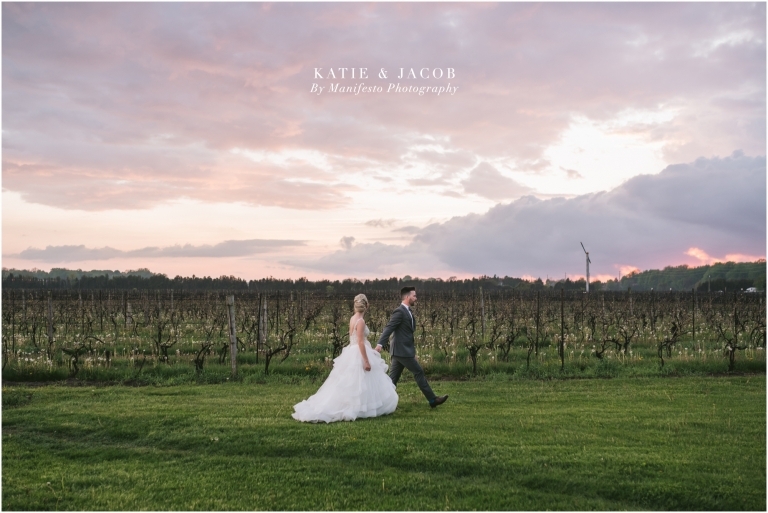 Katie & Jacob, your love is inspiring. Listening to you tell us your story only solidified the feeling we already had about you two, that you were right for each other. We love how you respect and honour each other with your words and actions. Things just align for you guys and it’s crazy, but makes sense. We’re so happy for you!